Salvia officinalis ‘Icterina’ is also known as golden sage. 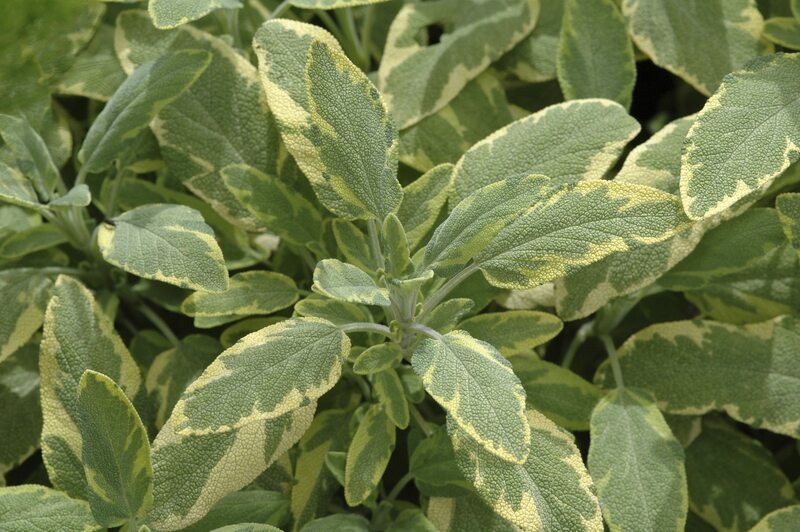 Golden sage has the same aromatic and flavor properties of traditional sage but boasts lovely variegated leaves that are a contrast from the grayish leaves of common garden sage. Is golden sage edible? 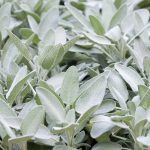 You can harvest leaves from Icterina just as you would garden sage and use in the same culinary manner, but you get a more eye appealing foliar display that adds some punch to your herb garden. Learn how to grow a golden sage plant for aroma, flavor and non-toxic pest control. Sage is a historic herb with a long tradition of both culinary and medicinal use. Growing golden sage offers all these applications as well as a unique twist on the appearance. Its cream-colored leaves are decorated with an almost lime green patch in the center, which is irregular and varied on each leaf. The overall effect is striking, especially when combined with other herbs. Golden sage produces a small shrub-like plant which may grow up to 2 feet tall and spread nearly twice as wide over time. This sun lover prefers soil slightly on the dry side and is drought tolerant once established. An interesting bit of golden sage information is its relation to the mint family. The aroma is not similar but the slightly fuzzy leaves are characteristic of the family. This sage, like its cousins, is a cultivar of the standard variety, Salvia officinalis. There are several variegated sages, among them Icterina and Aurea, which has more golden tones. Each is edible and useful in many home applications. Small starts are readily available in many nurseries. Golden sage can also be propagated from cuttings. Many growers say Icterina does not bloom and is strictly an ornamental, but in my experience, the plant produces gorgeous purple flowers in late spring. Seeds can be unreliable, so growing golden sage through spring cuttings is a quick and easy way to make more of these lovely little shrubs. Root cuttings in sterile potting soil and keep evenly moist. To enhance rooting, provide heat and humidity by placing a bag or clear cover over the plant. Remove the cover once per day to release excess moisture and prevent root rot. Once the plants have rooted, move them to larger containers or wait until the following spring and harden them off. Then plant them in loose soil outdoors. Sage is a fairly self-sustaining plant. It doesn’t necessarily need fertilizer in spring but a good organic mulch can enhance plant health. The plants tend to get woody and leggy, so pruning is essential. A key to golden sage care and appearance is to cut it back in late winter to early spring or before flowering. Avoid pruning out the woody material unless it is dead, as this can result in die back. Some growers claim that planting golden sage in light, chalky soil will prevent the leggy characteristic. Alternatively, you can pinch new growth during the growing season to force the plant to produce more shoots and a more compact plant. The Icterina cultivar is hardy to United States Department of Agriculture zones 5 to 11 and needs little special winter care. Golden sage performs well in containers or in ground situations. Just provide moderate water and bright sunshine and your plant will reward you with a blaze of variegated, light catching foliage all summer long.